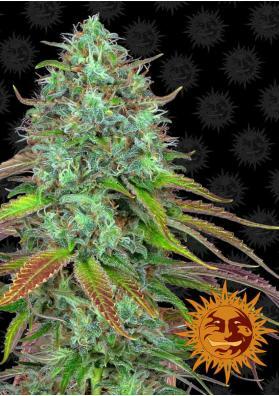 LSD Auto feminized marijuana seeds are the sister of Barney's Farm's famous LSD now in autoflowering version. A powerful hallucinogenic effect in just 63 days! The autoflowering marijuana seeds LSD Auto are a strain presented by Barney's Farm Seed Bank to respond to all growers who love their famous LSD but couldn't grow it, either for lack of space or because of the more austere climate in their area. Result of the crossing between the LSD and a Super Magnum Auto this strain presents enormous yields for an auto and an effect very similar to that of its photoperiodic sister. The LSD Auto strain is very easy to grow and very resistant to external factors to the crop, whether fungi, pests or low temperatures. With a height not exceeding 120cm, is an ideal plant for lovers of LSD but do not have the space or climate to grow it. With this strain the results come faster and do not disappoint! In relation to the production of LSD Auto this is very high for an autoflowering plant that takes just 63-70 days from germination, either indoors or outdoors. When grown under grow lights, with the security of the growing room, we can expect yields of up to 600 grams per square meter. Outdoors, with the help of sunlight, can produce up to the incredible 400 grams per plant. As a good autoflowering plant, it can be grown outdoors at any time of the year as long as there is more than 4/5 hours of direct sunlight. The flavor and aroma of LSD Auto is complex and blends flavors as different as moist soil, mango, citrus and skunk. It is an ideal strain to try among friends and try to decipher every point that exists in its aroma. The most remarkable feature of LSD Auto is its incredible effect, quite powerful and offers an unforgettable journey to all who try it. Not recommended at all for less experienced smokers, its psychedelic effects will find new worlds to all who try it. Ideal to use between friends and enjoy the trip. Full cycle: 63-70 days on indoors and outdoors.